We have known the personable and talented “Cooking Ladies” for some time. 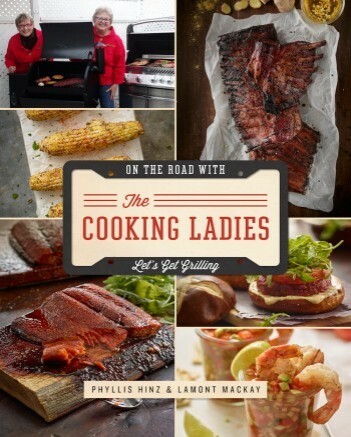 So when their new cookbook, On the Road with the Cooking Ladies: Let’s Get Grilling, was published, we couldn’t wait to see it. And It has exceeded our expectations. Phyllis Hinz and Lamont MacKay have an enviable but demanding lifestyle. About ten years ago, after extensive careers in the food industry as restaurant owners and consultants, caterers, food writers, TV personalities and speakers, they applied their culinary experiences to their travels across Canada (their home country), the United States, and Mexico in their 40-foot motorhome visiting restaurants, tasting regional cuisine, shopping at farmer’s markets and grocery stores, and interviewing chefs. On the Road with the Cooking Ladies is an outgrowth of their experiences. This cookbook is unique because it is so much more than a cookbook. In addition to presenting some wonderful grilling recipes, the book takes you on the authors’ travels as they focus on the culture and grilling cuisine of a variety of towns and regions. We happen to be people who love to read cookbooks, but even if you aren’t a cookbook aficionado, the travel stories are entertaining and fun to read. Readers can vicariously experience different parts of North America with its wide-ranging cuisine and varying cooking traditions. They also visit a wild and crazy bar called Lute’s Casino in Yuma, Arizona, known for its eclectic memorabilia and scrumptious Southwestern dishes. They visit Key West, Florida, where roosters wake them up every morning. And the related recipe for Hot Orange Chicken Drumsticks combines “the attributes of Key West: citrus, heat, and, of course, chicken.” And we loved reading about their visit to one of our favorite restaurants, Jeremy’s on the Hill, located close to the historic gold mining town of Julian at an altitude of more than 4000 feet. 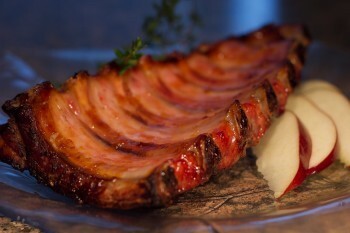 They feature Jeremy’s signature Bacon Brussels Sprouts, which we have ordered and adore. Now we can make them ourselves. 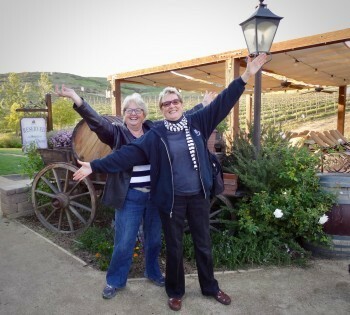 And we were pleased to see their description about our hometown of Temecula, California, where they enjoyed our authentic frontier ambiance and rolling hills of vineyards. Their melt-in-your-mouth Reverse Seared New York Strip (photo left) may have been inspired by the great wine they tasted in our wine country. 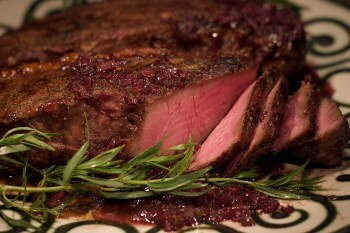 We have tried this recipe and found it a unique and delicious approach to grilling steak. 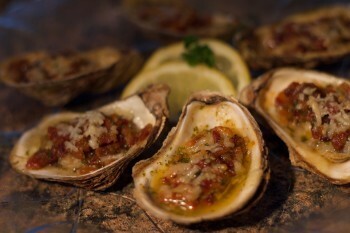 There are so many recipes we intend to try, such as Honey-Lemon Herbed Chicken Halves, Smoked Turkey Legs, Lamb Loin Chops with Orange Zest, Wild-Rice Stuffed Pork Tenderloin, Apple Rum Baby Back Ribs (photo right), Rocky Point Shrimp Cocktail, Cast Iron Sweet & Sour Meatballs, Marinated Beef Kabobs, and Bacon-Infused Malpeque Oysters (photo below right). The cookbook also includes tempting vegetable and dessert recipes, such as Loaded Zucchini Boats and Grilled Pound Cake with Oranges & Chocolate. We could go on and on listing appealing recipes. Our goal is to try them all. The recipes are simply presented and easy to follow. Beautifully illustrated with tantalizing photos, this high quality, oversized paperback book has been sitting on our coffee table for a few weeks and attracts lots of attention from our guests. The book also includes helpful grilling tips, which, even though we’ve been grilling our entire lives, were unique tips that have already made our grilling easier. In addition, the cookbook includes a list of Safe Food Handling Tips that we found especially helpful. On the Road with the Cooking Ladies is available for about $28 on Amazon and at bookstores across the county. To learn more about the Cooking Ladies, you can go to their website at http://www.thecookingladies.com/.